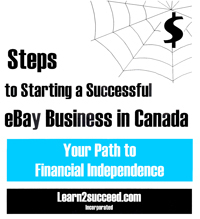 This book will help every Canadian who wants to start a business using eBay. It outlines 12 basic steps for success and covers issues specific to Canada (unlike most other books which are written for Americans). Welcome to the World’s Largest Auction! Learn how eBay started; how big it has grown and the basics of selling by auction on eBay. Step 1 Look For Products to Sell on eBay! How to locate products to sell, where to look and how to get the best prices. Products you are prohibited to sell. Step 2 Research Your Ideas! Using eBay, the Web and traditional sources to conduct your research. Step 3 Establish Your Pricing Structure! How to calculate your true acquisition or manufacturing costs; establish your desired margins and set your prices. Take a look at pricing as a function of "Perceived Value". Step 4 Present Your Products in the Best Way Possible! Learn about the basic elements of your eBay listing; about image sizes and file formats; digital photography, scanning and image editing. Step 5 Make Sure You Get Paid! Learn about payment gateways, PayPal, accepting payment by credit cards, cheque or money order and some things to look out for. Step 6 Make Sure You Deliver Promptly! The fulfilment process for digital and non-digital products. Shipping charges and US-Canada cross-border shipments. Overseas shipments and insurance. Step 7 Don’t Forget the Element of Trust! The importance of your "About Me" page; how to create it and use it effectively. Step 8 Open Your Own eBay Store! The requirements to open your own store; how to name it, build it and promote it. Step 9 Keep Your Customers Happy! The significance of the eBay Community, how to keep on top of your e-mail, use cross-promotions and coupons when you ship. How to handle vacations. Advice on how to handle disputes. Step 10 Learn More About eBay! Use your HELP Button! Find out about the eBay Learning Centre, eBay Live, eBay University, eBay Radio and how to get extra assistance at the Powerseller level. Step 11 Set Up Your Business! Possible legal structures for your business, sales tax and vendor permits and the issue of registering trademarks. Step 12 Start Now! Prepare your eBay business plan; calculate your cost of doing business on eBay; calculate your sell through rates and your average selling prices. Don’t forget that eBay delivers lots and lots of eyeballs!